In October 1965, a protest movement took root in the US. It was to last until the US began its pullout from Vietnam in 1973. The received wisdom on its cause has always been the sudden increase in draft or conscription numbers for the war. Some commentators believed that the advent of same day broadcasting and cheap video tape energised the protests. Now with a bit of help from the web, we can carry out a forensic autopsy on the protest movement to discover the true reasons for the widespread and prolonged convulsions the US has ever experienced on its own soil. Discovering the root cause is the first step towards understanding the severity of the 1960s protests. More meaningfully, we'd want to know why the protests then died down after the early 1970s. Knowing the real pattern is useful because that pattern will be our guide for appreciating the current occupy protests that are shaking at the core of the Western civilisation. As protests are usually linked to economic crises, the US GDP (see chart below from Forbes magazine) is a good subject to start with. The period 1965-1970 was characterised by plummeting GDP ending in the 1970 recession. Growth picked up post-1970 especially after Nixon broke the fixed link between the US dollars and gold in August 1971. Two years later, it dropped again as a result of the oil price surge following the OPEC embargo. The surprising thing is that there have been no widespread protests since despite the occasional episodes of falling GDP, in some cases much worse than the late 1960s. That is, till now. The mass protest movement has now begun to rear its ugly head not only in the US but throughout the world. What drives people to join forces in voicing out their grievances in the open? Not once but repeatedly and simultaneously in places far distant from each other. Surely there must be a unifying cause but behind that cause there must exist a social tension that galvanises the protesters. And what better catalyst to fuel that tension than economic anxieties and difficulties. 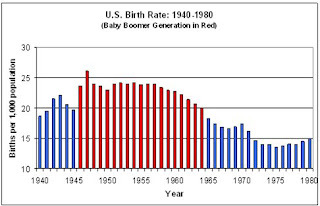 The 1950s and 1960s were probably the most economically prosperous period in US history. In fact it would have been the longest US economic expansion had not a 10-month recession in 1960 interrupted the relentless growth. The rise of the protest movement towards the end of the period was therefore totally unexpected and hasn't been plausibly explained. In most written accounts on the protests, the generally agreed upon cause is the Vietnam war. Yes the Vietnam war is the plausible cause but the real cause lies much deeper. A true understanding of the 1950s and 1960s decades are called for. 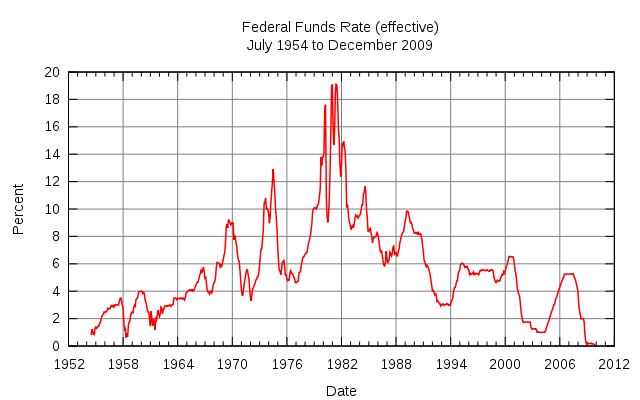 A look at the Fed funds rate (see chart from Wikipedia below) immediately tells of the difficulties that the US was facing in the later half of the 1960s. Up until August 1971, the dollar was the primary anchor currency under the Bretton Woods monetary system in which its value was fixed at US$35 per ounce of gold. This meant the US economy would increasingly become more uncompetitive as other currencies could be devalued relative to the dollar. The gold outflow was a strong sign of this uncompetitiveness as speculators were betting that the dollar would fall. The inherent weakness of the dollar was reflected in the free market price of gold which in 1968 was trading at $41 per ounce. To stem this fall, the Fed funds rate had to be steadily increased peaking at 9.19% in August 1969. Contrast this to the previous 20 years in which the rate had never exceeded 4%. President Johnson's spending on the Vietnam war and Great Society - mainly Social Security and healthcare - started to creep up from 1966. However it was the expansion of credit for business corporations and households that had been fueling the economy prior to Johnson's escalated spending. As inflation inched up in 1966, the Fed raised the Fed funds rate to 5.76% by November 1966, slowing the economy in the process though Johnson's public spending prevented the economy from falling into recession. The impact can be seen in the money supply measure, the best being the total credit market debt (see chart below) instead of the generally accepted M1, M2 or M3. 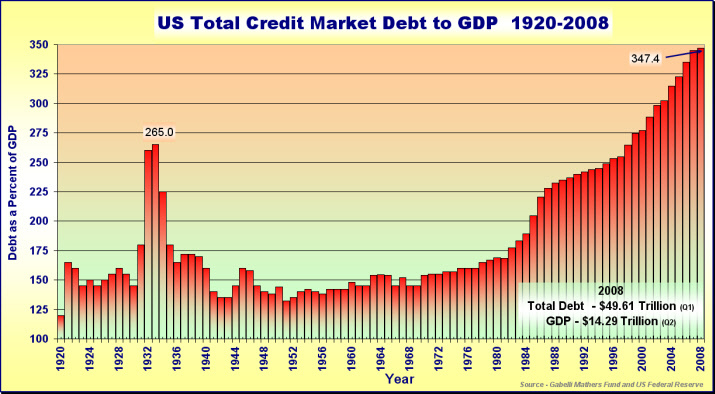 In 1966, 1968 and 1969, the total credit relative to GDP was lower compared to the three years preceding 1966. This was the primary cause of the 1970 recession much as the contraction in 1960-61 had contributed to the recession of those years. But the economic difficulties were not evident from the unemployment rate as seen in the misery index (see chart below). Yet the inflation rate was increasing despite the slowdown in debt growth. Obviously there must be something that had been constraining capacity reducing its ability to match the debt growth, even though now subdued. Remember that during this time the US was still having a current account surplus (see right panel of the chart below from The Economist), albeit with a declining rate, so the foreign countries couldn't have supplied the goods either to meet the demand from the higher money supply. Even the US industrial production was running above capacity throughout the second half of the 1960s (see graph below from The New York Times). So goods and services supply were tight, thus the inflationary conditions. But inflation couldn't have been the main culprit since in later years under Gerald Ford's and Jimmy Carter's watch, during which the protests no longer resurfaced, the inflation rate was much worse. The 1960s was also the beginning of the fourth Kondratieff wave. It would have been impossible for the growth drivers (computers and internet) of this wave to have kicked in at such an early stage. After eliminating all suspects, we are left with only one. 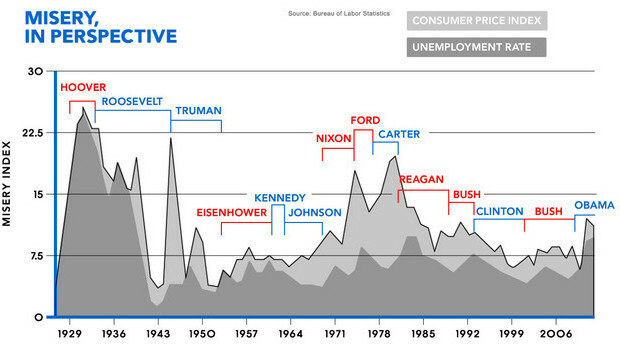 It is the one that enabled the US to get out of the economic doldrums of the late 1960s and early 1970s. But its contribution has not been given the credit to which it richly deserves. It is the increased female participation in the labour force. And the driver that enabled the women to enter the labour force in great numbers was electricity, the main engine of the third Kondratieff wave. Electricity-enabled home appliances which began to enter the market in 1930s to 1950s allowed women to have more free time. So by the mid-1960s, the women started to enter the labour force in large numbers to supplement the income of their spouses. But the overall impact was felt only from the 1970s since the inclining women labour force participation rate (LFPR) outweighed the declining male LFPR only then (see graph below). As household income increased, the urge to protest declined. The impact of the roughly 8% higher LFPR was significant, not only because the productive capacity increased but also the consumption ability grew. However after the drivers of the fourth Kondratieff wave entered the economy in a big way - computers in the 1980s and internet in the 1990s - the LFPR began to flag. The new drivers make it possible to run operation with a greatly reduced number of workers than before. Globalisation worsened the already bad situation. Capacity swelled as foreign countries became part of the supply chain. Initially inflation was a scourge because certain commodities, in particular oil, had a lag of 7 to 10 years to come onstream. Well the new oil fields are now ready to be tapped at a time money supply is fast shrinking with massive debt write-offs. The world will be awash with cheap goods but bereaved of money. Worse, the high female LFPR is producing a backlash since population growth is also decreasing as women have reduced their fertilility rate (see chart on the left). Our ability to consume the plentiful goods produced has thus been severely depleted. Now you know why the protesters have taken to the streets. What they need now is a strong galvanising cause. In the 1960s, it was the Vietnam war. The Afghan war pales in comparison as the number of soldiers fighting is relatively very small. That leaves the Wall Street and the top 1% of the wealth owners. But nobody knows who are in that group and nobody wants to claim to be in it either. An amorphous target is not a valid cause. We don't know what the eventual cause will be but the one thing that we can surely expect is that the protests are going to turn more violent.